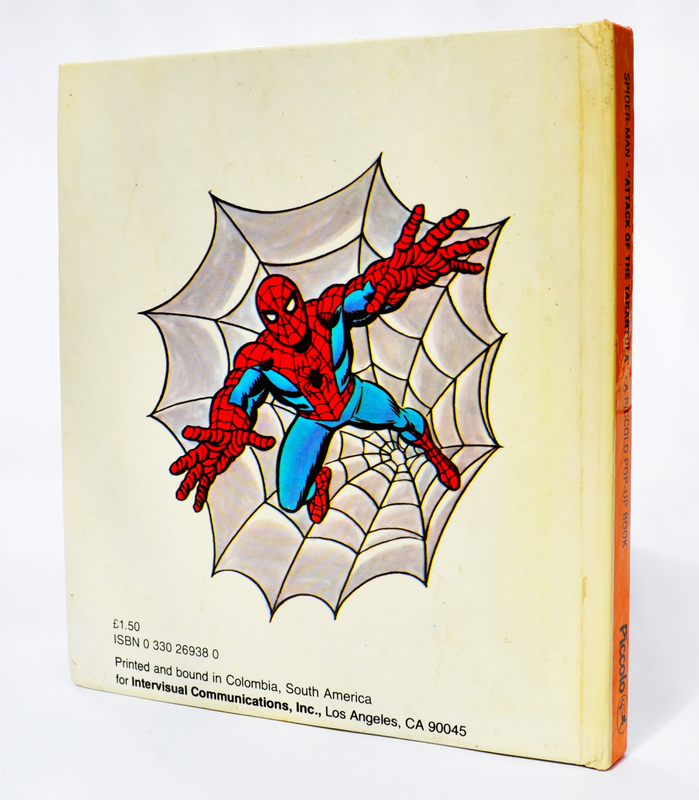 Piccolo’s Spider-Man: “Attack of the Tarantula!” pop-up book (1982) | 'TAIN'T THE MEAT… IT'S THE HUMANITY! 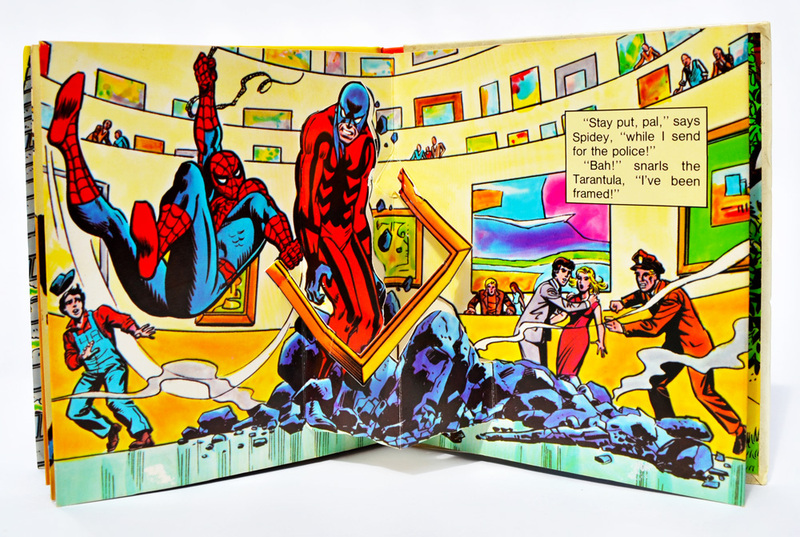 Time for another trip to the ‘Tain’t The Meat Vault of Comic Book Memorabilia. 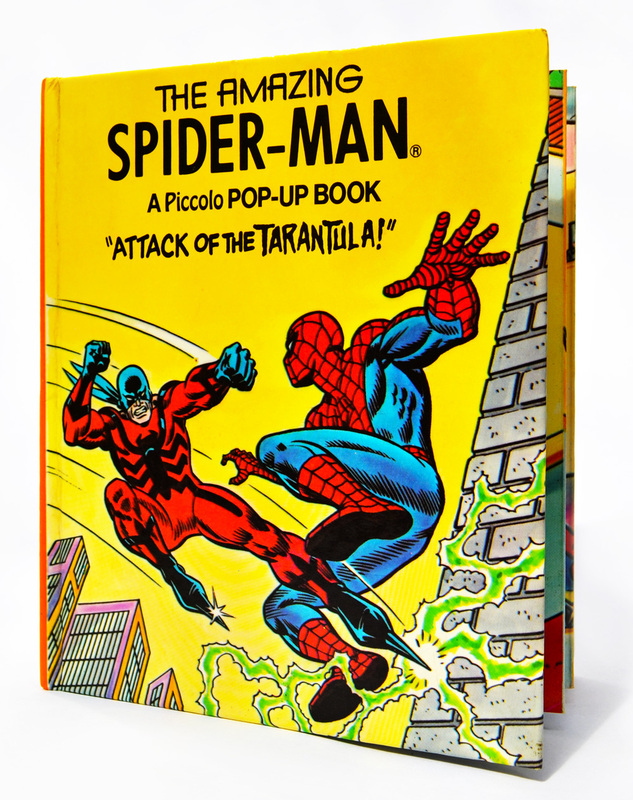 Published in 1982 The Amazing Spider-Man: “Attack of The Tarantula!” was the second pop-up book by Piccolo that featured the popular Marvel Comics superhero. 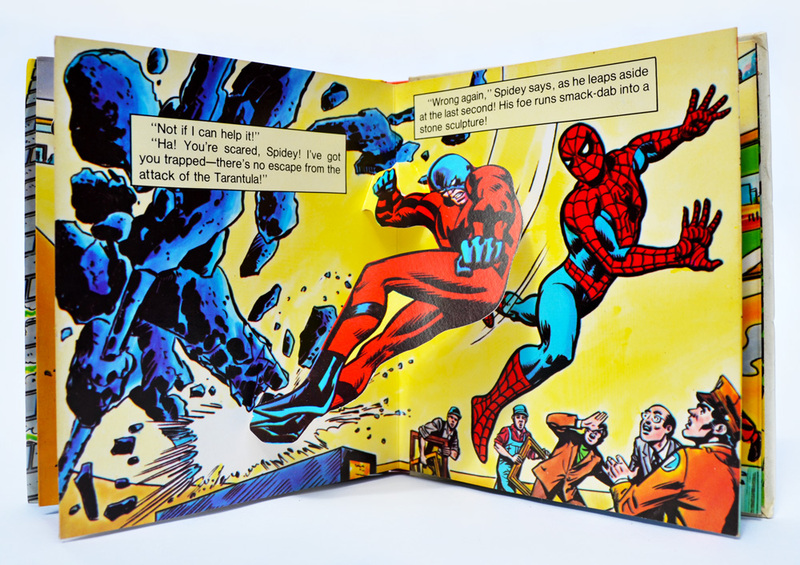 Like the previous book (click here) this edition featured a short story depicting Spider-Man in battle with the villainous Tarantula, with the book utilising pop-ups to enhance the story. The book ran to 14 pages, was printed in hardback and the UK edition sold for £1.50, or £4.50 when adjusted for inflation. (I’ve just looked-up listings for the book on ebay and a couple are on sale for over £100. I don’t imagine they’ll be flying off the shelves any time soon). Sadly Piccolo made some changes to the format after the release of the original Spider-Man book. First off this edition measures a pretty puny 5.5 x 6 inches, almost half the size of the first book. 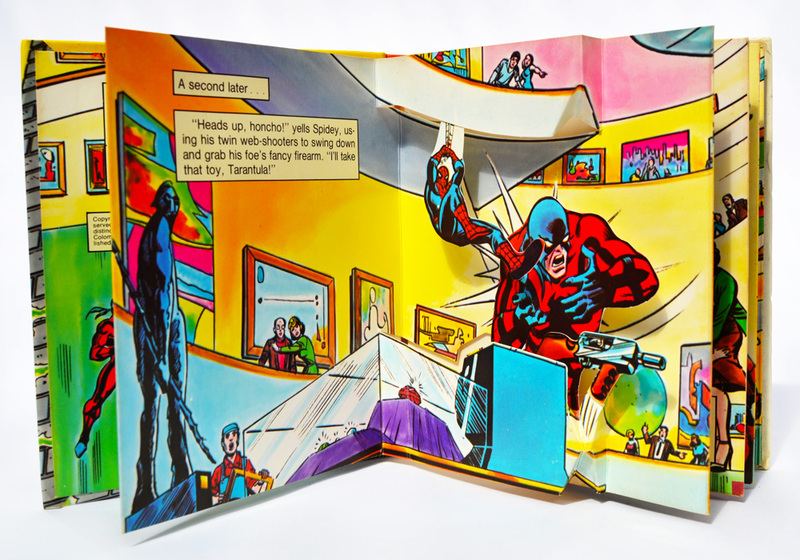 Apart from the inevitable loss of impact to the illustrations, the smaller size left no space for the pull ‘tabs’ that had helped make the first book so much fun. The extra two pages are welcome but the loss of the tabs is regrettable. 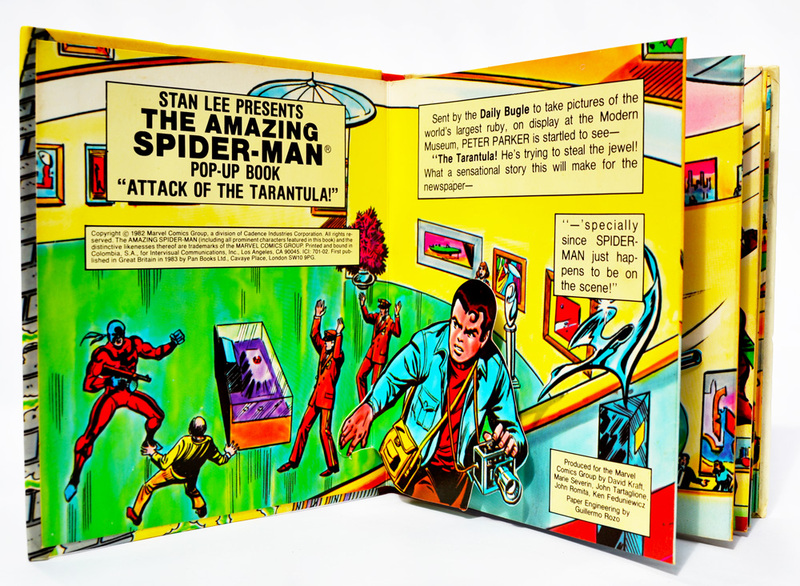 “Attack of The Tarantula!” was produced with the help of some Marvel Comics regulars, including Marie Severin, John Tartaglione and Spider-Man artist John Romita, while the pop-ups were engineered by Guillermo Rozo, who also worked on a couple of other Piccolo/Marvel pop-ups . The pop-ups aren’t as good as the one from the previous book. As a result of the book’s smaller size the pop-ups don’t, well, pop as much as they should. 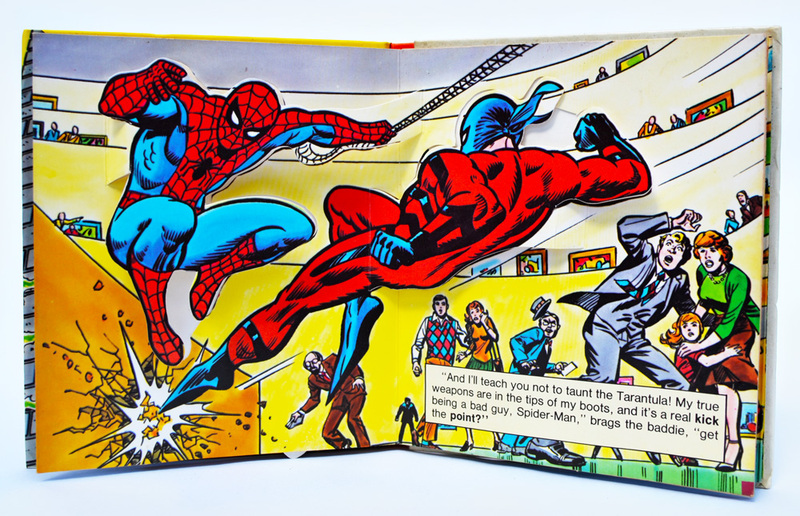 Some of the pop-ups were also prone to being easily damaged – the thin picture frame that Spidey uses to snare The Tarantula bent out of shape after only a few views. The story concludes with Spidey getting his photos to sell to The Daily Bugle while The Tarantula is led away. 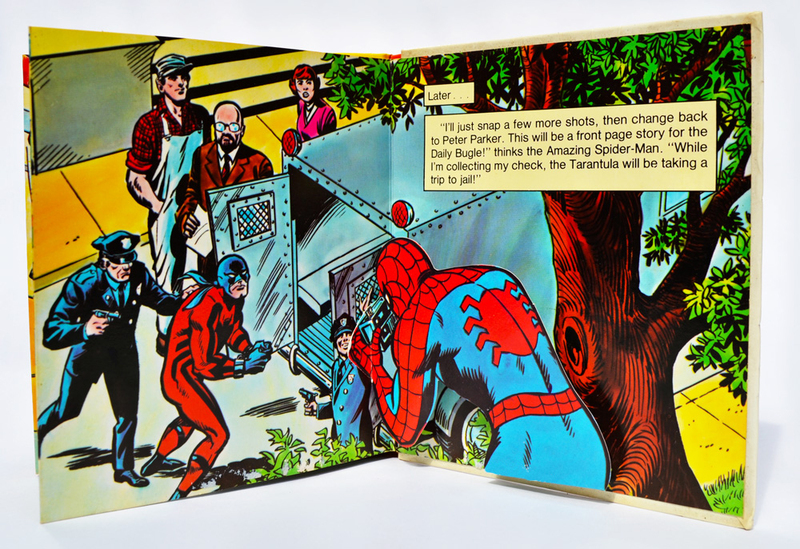 There was one more Spider-Man pop-up book published by Piccolo in 1982, “The Schemer Strikes!” — click on the link to see more.